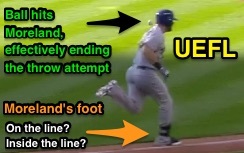 Official Business presents Runner’s Lane Interference: baseball’s most efficient way to shoot yourself in the foot. This is a look back and analysis of Monday's RLI call in Cleveland. 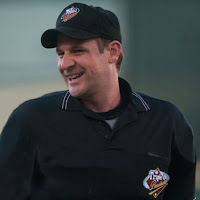 The following is commentary from Official Business CEO and former MiLB Umpire Brian Hertzog, who ejected Eric Hosmer in 2014, and presided over a few bench clearing brawls in Triple-A (6/23/13: Isotopes-Redbirds; 7/27/14: Isotopes-Aces). His full resume may be found at the bottom of this article. 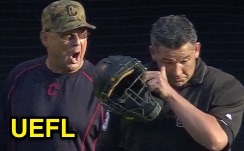 It didn’t take too long to start receiving calls and texts about Monday's play [MLB Ejection 065 - Manny Gonzalez (1; Terry Francona)], and rightfully so, it was quite interesting. In the days that followed I read comments ranging from “Manny got this right!” to “This is a bad miss by Manny on a relatively ‘easy’ call.” Most seemed to be leaning toward that later thought process though. While there are plenty of RLI calls that I would consider “easy,” this is hardly one of them. RLI only can exist when B1 is not in his lane. One key point of emphasis I’d like to throw out there before we get too deep in the rule… you can’t have Runner’s Lane Interference until you actually have the potential for Runner’s Lane Interference. While this seems like an obvious statement, most arguments I’ve seen for Home Plate Umpire Manny Gonzalez missing this play are referencing Moreland leaving the three-foot running lane before he reaches first base. While we can all agree that Moreland does exit the running lane before he needed to “for the sole purpose of touching first base,” this alone isn’t enough information to make an RLI call. Rule 5.09(a)(11) Comment: The lines marking the three-foot lane are a part of that lane and a batter-runner is required to have both feet within the three-foot lane or on the lines marking the lane. Terry Francona did not like Manny's ruling. This is very similar to a batter being in a legal position when he makes contact with a pitched ball, with his foot partially on the line that makes up the batter’s box. Even though only part of his foot is on the line, this is a legal position. Since the lines that make up the three-foot running lane are part of that lane and he is permitted to have his feet “within… OR on the lines,” this means that Moreland’s foot being in contact with any part of the line means that he is in compliance with OBR. OBR 5.09(a)(11): In running the last half of the distance from home base to first base, while the ball is being fielded to first base, he runs outside (to the right of) the three-foot line, or inside (to the left of) the foul line, AND in the umpire’s judgement in doing so interferes with the fielder taking the throw at first base. The pesky part about that last sentence though… the word “AND.” For this play to be called RLI, Moreland needs to be running inside the foul line (and we established that he’s not) AND interfere with the fielder taking the throw at first base. If you don’t have Moreland running inside the foul line, then he isn’t in any illegal position where he could be interfering with the fielder taking the throw at first base. The throw hitting Moreland simply becomes… baseball. You need to satisfy the first part of the rule for the second part to be relevant to the play at hand. The reason Napoli was unable to field the throw in this situation was not because Moreland prevented him from doing so with any type of illegal action. The reason was because the throw hit Moreland, but it was very much while he was in a legal position. Everything after the throw hits Moreland while he’s in a legal position is irrelevant. Yogi-ism: B1 is in the lane until he is out of it. You can’t penalize Moreland in this situation for something he hasn’t done yet… and you can’t protect Napoli in fielding a throw at first base if there’s no longer any throw to field. One more step by Moreland though, and this call takes on a whole new life. I guess it’s not as “easy” as it looks.